Your guide and naturalist are here to help every step of the way on this excursion. Bald eagles are another common site, so don’t forget to look to the skies every once in a while. The shot everyone wants to capture! Don’t forget your camera. As a private tour, you’ll have plenty of time with your guide to ask questions and learn about the area. Whales won’t be the only wildlife around on this in-depth excursion. Little ones are welcome! We have life jackets handy to fit any size. Your remote beach landing is one of the best ways to experience wild Alaska. A curious seals may pop by to say hi. Breach! Humpbacks are the most common animal seen on this excursion. Juneau’s majestic mountains will provide with views throughout your private whale watching tour! Whale Tales are all special to the individual and help whale specialists tell them apart. Who knows, maybe you’ll spot one that’s new to the area! Keep an eye out for blows, it’s the easiest way to spot the whales! Orcas often make an apperience on this stunning wildlife experience as well! When researching what to experience on your trip to Alaska, one of the first things that is sure to pop up on your list is the whale watching Juneau Alaska is famous for! And what better way to experience these magnificent animals than an exclusive Private Whale Watching tour meant just for your small group. Escape the crowds on this private 4-hour experience where you’ll explore the calm Inside Passage waters that make the whale watching Juneau Alaska is known for so scenic & spectacular. This wildlife experience takes you right from the cruise docks on a trip out to the scenic Andrew's Marina at Fisherman's Bend. As you go, keep an eye out the windows, wildlife viewing doesn’t just begin when you hit the boat. As your Private Whale Watching tour departs the docks, your guides will set out immediately in search of the humpback whales. Because they've been tracking these animals for nearly 2 decades, you'll want to be sure to follow their gaze. You’ll explore the pristine waters of Juneau for 3 hours in search of Humpbacks & Orcas, as well as other wildlife including eagles, seals, porpoises and more. With a cap of 6 people on this tour, you’ll have plenty of time to ask your naturalist guide about the ecosystems of the area & life in Alaska. 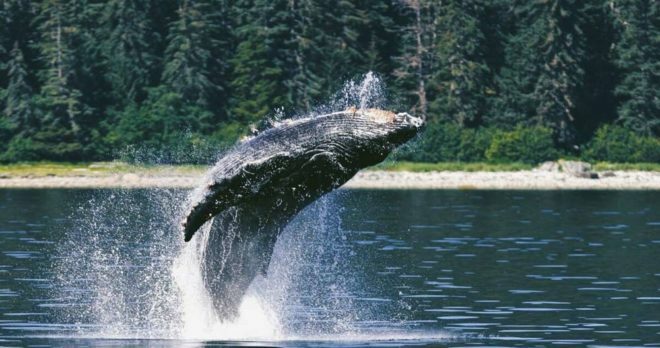 Along the way, you’ll experience what makes the Private Whale Watching tour truly unique among the whale watching Juneau Alaska offers: a remote beach landing! You’ll have the opportunity to depart the boat, stretch your legs, and explore the rugged shorelines. Your guide will talk you through the local flora and fauna as you explore the coast. If you're lucky, they'll even spot some starfish and stunning seashells hidden along the way. Then, it’s back in the boat for a refreshing snack and your return trip to Andrew's Marina. Be sure to break out the binoculars provided on board to check the seas for more wildlife, or venture out onto the open deck for unrestricted viewing. Want more wildlife experiences? Check out the Hovercraft Eco Adventure & Wildlife Viewing Tour in Ketchikan, or the Wildlife Safari & Bear Viewing Excursion in Skagway! Restrictions: This is a family-friendly tour and all ages are welcome. Accessibility: This tour is rated 'Easy' in regards to activity level. There are a few steps to get in and out of the bus as well as a rugged dock a maximum of 300 yards to get to the boat. Please contact us in advance if you require assistance and we will do our best to accommodate! What to Wear: We recommend hoping for sunshine but preparing for rain for all of our tours. Drizzles are common in this area so we recommend bringing a waterproof jacket. We typically recommend long pants for comfort & sturdy, waterproof boots or sneakers for the beach landing. And don't forget your camera! Q:Will we make it back to the ship in time? What if we don't? We've never left anyone behind and only schedule tours that work well with your cruise ship's itinerary. We leave plenty of cushion so you can confidently book your trips independently. Q:Is there a restroom on board the boat? Yes, there is a small restroom on board the boat and also an opportunity before leaving at Andrew's Marina. It's very rare that a ship is delayed into port, but in those cases, we will try our best to work with you to reschedule the tour to a later time. If that is not a possibility or your ship doesn't make it into port, we will, of course, refund the full cost of the tour. Q:What should we wear and bring? This tour operates rain or shine, and rain is common as we lie in a temperate rainforest! For comfort, we typically recommend long pants, waterproof closed-toed shoes, and a waterproof jacket. Some guests choose to bring a small bag or backpack along to store extra layers, a bottle of water and cameras. Q:Can you guarantee that we will see whales? While this tour does not offer a guarantee of whale sightings, we are confident that we will find humpbacks for you to see! Our guides have been at this for 18 years, and know just the right spots to find whales & other wildlife. Q:How big is the boat for this tour? This 32ft catamaran offer's a comfortable and stable ride for its 6 passengers. Its drop bow feature allows you to easily step ashore without getting your feet wet. There are 2 outdoor viewing areas along with spacious seating inside.